Who wants to play a math card game? I’ve got the perfect deck of number cards 1-20. With the suits in the middle of each playing card and the numbers in the top left and bottom right, these cards are a sure bet for comparing games like War, matching games like Memory Match, and sorting activities (sort by suit, by number, or by color). You can teach kids about pairs, three in a row, a full house, etc. Don’t let the parents think you’re teaching your kids how to play poker – they’re powerful sequencing activities! 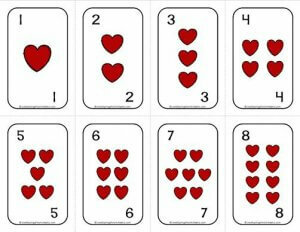 Go to this page to see all the number cards 1-20 playing cards.